Our Talmud proclaims that “When the month of Adar begins, we increase our joy”. Well, we are now into the month of Adar and one of our great, joyful Jewish holidays, Purim, begins on Saturday night. I encourage everyone to find a place to hear the Purim story by listening to the reading of the Megillah of Esther. Synagogues throughout our Pittsburgh area will have all different types of experiences. The Purim story commemorates the saving of the Jewish people by Queen Esther, making this a truly happy holiday. The critical point in the story when the Jewish people’s fate turns from annihilation to preservation is when Queen Esther proudly proclaims her Jewish identity to King Ahasueros who then puts an end to the proclamation to kill the Jews. Rabbi Danny Schiff, our Jewish Community Foundation Scholar, spoke about this concept of Jewish identity as part of his presentations at our Snowbirds events. I think about it in light of the bomb threats that have been targeting JCC’s and other Jewish institutions for the past few weeks (which Cindy Shapira and I wrote about last week in a community wide message). In fact, my hometown synagogue in Framingham, MA where my siblings and I became a Bar/Bat Mitzvah was one of this week’s targets (and was highlighted in a story in the New York Times). This makes all of these bomb threats, now numbering 140, very personal to me. This is a time when we need to be out front and proud to be Jewish. This is a time to show resilience. Over the past week, I have been mesmerized and a bit maniacal in watching the World Baseball Classic taking place in Seoul. Team Israel, a 200-1 underdog, won their third game in a row on Thursday beating the Netherlands. At the World Baseball Classic, national anthems of the two teams competing are sung prior to the first pitch being thrown. 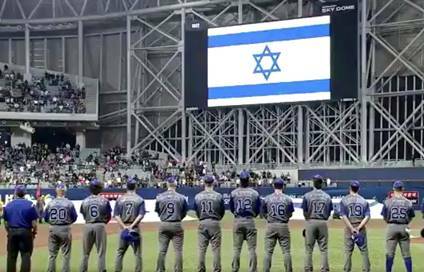 When the Hatikvah (Israel’s national anthem) was played, the entire Israeli team removed their baseball caps revealing Israeli Baseball Team kippot. Not all the members of the team consider themselves Jewish and yet they stood proudly in front of a predominantly non-Jewish crowd both in person and televised around the world with that obvious Jewish symbol perched on their heads. Let’s be more like Esther and the undefeated Israeli Baseball team. Now is the time to share and celebrate our heritage and identity. Shabbat Shalom. Happy Purim. Go Team Israel!!! !